The Secret Gestural Prehistory of Mobile Devices is cultural anthropology. It seeks to recover those moments of intuitive prehensile dexterity, when the famous and the ordinary alike felt the unconscious desire to occupy their hands for an as yet unknown purpose. Like Roy Neary's obsession with the image of Devil's Tower in Close Encounters of the Third Kind (1977), this gesture was vague, uncanny and compelling. It is the intimation in images of a gestural second nature to come. Perhaps this time has arrived, now, when mobile telephonic and teletextual communications are unavoidably associated with the spectacle of intimate bodily gestures. But this intimacy has a prehistory, a psychopathology of unconscious gesture in search of a purpose. The visual archive is the unconscious of contemporary media culture's obsession with the occupation of the hands. It is a familiar, too familiar gestural ergonomics, a bodily pantomime imagining an indispensable, intimate apparel that has modified the body's relation to itself and remote others. At times this seems ordinary, in the form of a glancing touch of the ear, a casual glimpse of one's own hand. Yet it can be uncomfortably distorted, a contortion of ear and shoulder reminiscent of the arthritic malaise known as St. Vitus' Dance. Or an obsessive flailing of the hands while talking to oneself, as in certain pathological forms of mania and hysteria. These images are suggestive of gestural rhythms that synchronize the hand, the ear, the eye and the mouth. In this they foreshadow the potential media that will, in time, resolve these postural gestures into a meaningful function: the immediate and continuous communion with unseen and absent others. In some instances the confluence of the gestural ergonomics of mobility is so compelling that a telephonic or SMS scenario is the only explanation possible. Beyond fancy, fabulation or anachronistic conceit, such images are prehistories of an improbable banality that, today, is all too familiar. 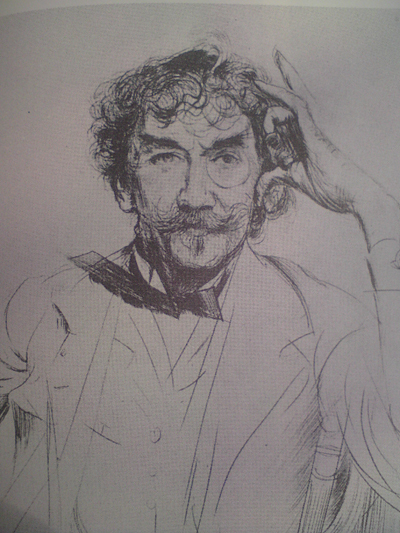 Paul César Helleu’s drypoint illustration of Whistler suggests a fin de siécle affectation that would still be unmatched one hundred years later. Get a free blog at WordPress.com | Theme: Under the Influence by spaceperson.